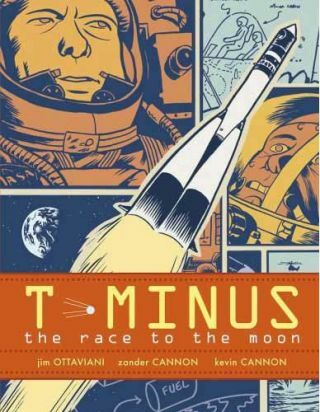 The new graphic novel "T-Minus" ushers the heyday of the U.S.-Soviet Union race to the moon into the realm of comics. In 1969, man first set footon the moon. In 2009, a new graphic novel will show readers what it took to getthere. Jim Ottaviani?sscience-themed graphic novels have covered everything from fossils (?Bone Sharps, Cowboys & ThunderLizards?) to the atomic bomb (?Fallout? ), and now he?s taking readers allthe way to the moon and back. ?T-Minus,? Ottaviani?s new graphic novelfrom Simon & Schuster, tells the story of the 1960s space race from aperspective that?s rarely been seen before, with art from Zanderand Kevin Cannon. Ottaviani gave SPACE.com?s sister publication Newsaramathe scoop on how his story is unique from other tales of the moon landing, andwhy this seminal event in human history remains important today. Newsarama: Jim, tell us about ?T-Minus.? Jim Ottaviani: Well, it?s the story of the US/USSRspace race, told in comic book form, but with a different focus from manyother books on the subject, since in addition to the astronauts and cosmonautsand politicians and everyone else who usually gets the limelight, this pointsthe spotlight on the engineers and scientists on both sides of the IronCurtain. And that perspective is something I don?t think you see too often inbooks on Apollo and Soyuz. NRAMA: Why did you choose this uniqueperspective? JO: Well, you know me! I?m alwaysinterested in the scientistsand engineers. And there are so many books ? many of them excellent ? aboutastronauts and cosmonauts, and relatively few about the scientists andengineers who built their rockets and spacecraft, that I thought shining thespotlight on these folks would be a) new to many people, and b) kind of fun. Maybe there?s a c) in thereas well: This is aimed at a younger audience than most of my other books. Whenyou think about your chances of becoming an astronaut, they?re very, verysmall. But being involved in spaceexploration and rocket science is still possible, if you don?t limityourself to the goal of strapping into one of these things and flying out ofthe atmosphere. So I hope those a few ofthose readers will tip to the fact that there are fascinating things to do andsee and learn and take part in that don?t involve becoming an astronaut, which,as I?ve said, is really, really hard and unlikely for most people. NRAMA: How did this book come about? JO: Planning and luck. I didn?t haveto be persuaded to write something like this ? I?ve always know I would do itat some point! So the plan part was in place. The lucky part was when my agentidentified a publisher, in this case Simon & Schuster and their Aladdindivision for young adult books, and found that they wanted a proposal forsomething just like what I wanted to write. Even better, the folks at Aladdinwere relatively new at graphic novels, and the suggestion was that we puttogether a team for the book and package it ourselves. So I thought of people I?d worked with before that I wanted to work with again,and Zander and Kevin Cannon, with whom I?d done ?Bone Sharps, Cowboys & ThunderLizards? were perfect. The proposal was actually not just aprose description of the book, but also included some comic pages from thebook, so Simon & Schuster would have an idea of what the book would belike. NRAMA: You sometimes use a variety ofartists in your books, but it?s just Zander and Kevin this time, correct? JO: Yeah, just Zander and Kevin.They?re a pretty seamless mix ? you?d be hard-pressed to tell who did what atthis point when you see the final art. One thing Kevin does for sure is thelettering, and Zander does a lot of figure drawing, but overall, it?s a prettytightly-woven braid.Beautiful. And they?re as keen ongetting the story right, and the storytelling right, as I am so that?sbeautiful too. The interior design is integrated with the story based on someideas by me, some by them, the cover design is theirs, I wrote the cover copy.We got to do the complete package ? like I said, it?s a tightly woven braid. NRAMA: The 40th anniversary of the moonlanding is coming up this summer. What do you feel people can learn from thespace program? There?s often been a sense that we haven?t lived up to ourpotential when it comes to space. JO: Well, I think that one of the bigthings we can learn and think about is that in the 1960s we made this huge pushto do something that had never been done before, we took TV cameras along toshow every step of the journey, it excited the whole world, and then...wedidn?t continue on. Now, that?s not to saythere haven?t been a lot of really interesting things done in space since then.We?ve put hundreds and hundreds of people up there ? and we?ve sent a whole lotof robots to planets and out into the solar system and beyond that. But a lotof the excitement is gone ? we?ve lost that, for whatever reason. So I think the importantthing to remember and learn is that we once didthese marvelous things ? that we put together huge teams of people to makethe lunar landings happen, and we can solve problems that, prior to beingstated, didn?t even exist in the minds of most people. I mean, take your averageperson in 1962 when Kennedy said, ?We will go to the moon by the end of thisdecade.? That wasn?t a shared dream at that point, not in the US or Russia, butpeople got excited about it. And they did something that most consideredimpossible. We have similar, seeminglyinsurmountable problems today. Some of them we?ve already been able to name. Soif we look back at what we were able to do in a fairly short time by dedicatingour resources, intellectual and financial, to a shared goal like this, I thinkthat?s a very hopeful thing. It gives you a feeling of, ?Yeah, we could dothings like this again! We could solve some of these problems that we?rehaving!? NRAMA: What?s next for you? JO: Well, there are two books in thepipeline for First Second. One is a biography of Richard Feynman, one of myphysics heroes, and the other is the story about the three most famous primateresearchers: Jane Goodall, Diane Fossey and Birute Galdikas. Like I said, they?re in thepipeline; I?m pretty sure the Feynman artwork is complete or almost complete,and that book will probably come out next year, though you?d have to check withFirst Second about that. The Goodall/Fossey/Galdikas book will come out theyear following that. And I?ve got a whole bunch of proposals in the pipeline,though nothing close to finished yet. NRAMA: Do you see yourself branching outinto fiction in the future? JO: It?s possible! One of theproposals I have is actually a novel ? it could be a GN or a prose novel, butit?s something I?m working on to send out to publishers. It?s also possibleI?ll put it out myself through G.T. Labs. NRAMA: How much research do you do forone of your GNs? JO: It?s almost impossible to answerthat question. To give you an idea, let?s take a look at the full bibliographyfor ?T-Minus?... [thumbsthrough pages] let?s see, with annotations the full bibliography runs eightpages. So I guess the correct answer is, ?A lot!? The space race is a nicething to work on because it?s so well-documented. But there?s a lot to researchfor any book ? you want to get a feel for the times. You want to understand thesocial situation, the political situation ? and have a lot of cool visuals foryour artist to draw. For ?T-Minus? we wantedto be careful about anachronisms ? when it comes to the space race, there are alot of people who are obsessive about this! I?m one of them. So we wereextremely careful about getting things right visually. I?m sure there are somemistakes, because the story is complex, but at least they?re not there becausewe couldn?t be bothered to try and get it right! At the same time, therewere things we had to do with the book that were not 100 percent accuratehistorically. For example, the total number of people who worked on the Apollo,Gemini and Mercury programs is estimated at around 400,000 people in the US. Ina 128-page book, if you wanted to show them all you?d have to find a way to getabout 3,000 people onto each page! So you have to compositesome people, to help the story move along. But the goal is to keep the readermoving through the story, so they understand the facts and the detailsregarding how things went down. I should mention, I have 37 pages of script outtakes and scene descriptions wecouldn?t fit into the story. So maybe one day there?ll be a director?s cut of ?T-Minus? that willbe five times as long as this version! NRAMA: And finally ? give our readers thehard sell as to why they should pick this up. And besides being a greatadventure, we learned a lot about the moon. Even better, we learned even moreabout the Earth. I don?t want to spoil too much, but one of my favorite partsof the research was reading the accounts of astronaut after astronaut who saidsomething to the effect of, ? I set out to go to the moon, but the mostsignificant part of my journey was looking back at the Earth on my way to themoon, and even more so coming back.? It really speaks to theidea of having one goal when you start a great endeavor, and discoveringanother even greater one by the time you finish. Every single astronaut ? andthese are hard-core, type-A, career military men ? every one became poetic when talking about looking back atthe Earth. That image of the Earthrising over the moon became the symbol of the environmental movement, and itwas taken by a bunch of test pilots fighting to look out the window. They gotcaught up in the wonder of it all. I?d like to see something like that happen again. As cool as it is that we havethe Rovers on Mars, what I live for is the day when I see ?Live from Mars? onTV, just like I saw ?Live from the Moon? 40 years ago.